The exhibition poses a question: how do young artists, who have just graduated from arts schools, function while having to earn their living? Before a few of them become famous artists who will be able to sell their art, they must earn money in a different way. This sad fact makes many talented artists give up art. The project is a commentary on the Polish situation but it is not an unknown question in other countries. 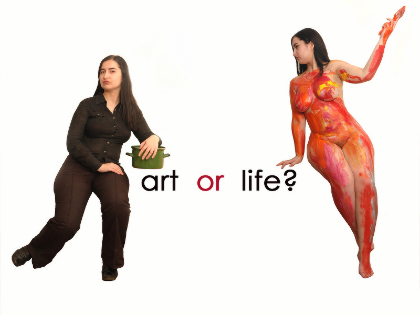 The work "Art or Life" was prepared for the exhibition "Art after hours". It consists of a poster that refers to Titian's "Sacred and Profane Love". The poster is a double-sided puzzle and small black and white pictures, that show how to assemble the puzzle pieces. In my work, I am the personification of both "sacred" and "profane" love. In this case "profane" love means life and "sacred" love is art. The attributes I am using are a pot and a brush. My gestures symbolise the fact, that I have to choose between a calm, comfortable life for the price of resigning from art, or create art despite a lot of hardships and uncertain living conditions that are a consequence of that choice. My work is a game. A player can roll a dice six times. Every roll means a randomly picked event, which forces a player to to choose between two possibilities: a comfortable life without making art, or making art, despite the obstacles. 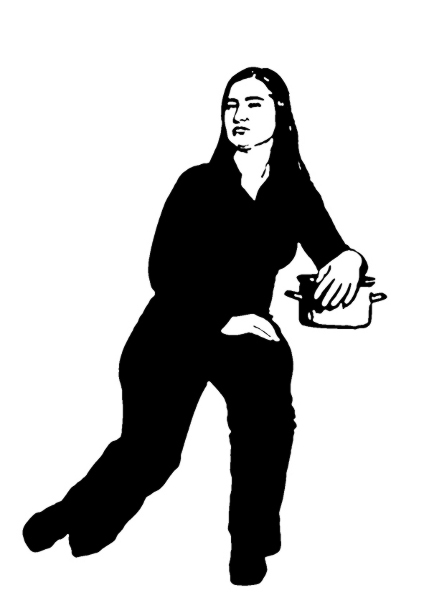 Consistent choices lead to success - the player completes one of two given pictures - with a pot (a personification of life) or with a brush (a personification of art). One roll is unfortunate. If a player rolls "six" he/she will not be able to make any choice and therefore to complete any of the two pictures. The player fails both in art and life.